I know this shouldn’t still shock me since I now live in Europe, but being able to check another country off of my list of places I have raced is still mind-blowing! 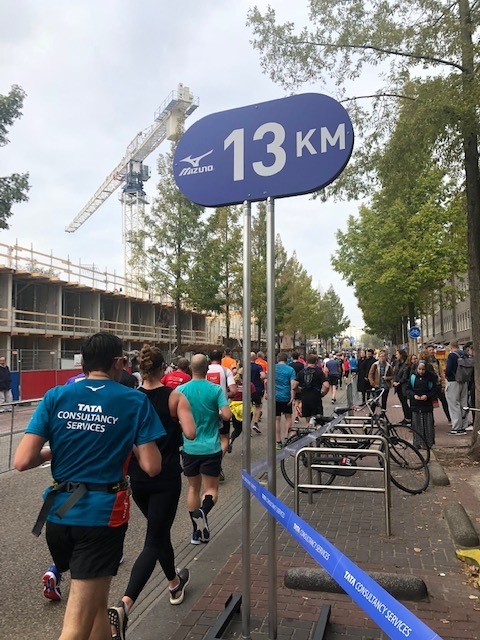 On 25 July, I registered for the Amsterdam half marathon thinking it would be the highlight of my fall after enjoying races in 2018 through Liverpool, Dublin, Disneyland Paris and gorgeous parts of Germany. But with the workload and stress I had, I went into the race exhausted - both mentally and emotionally. Even the day before the race, I wasn’t sure if I’d actually toe the Start Line. 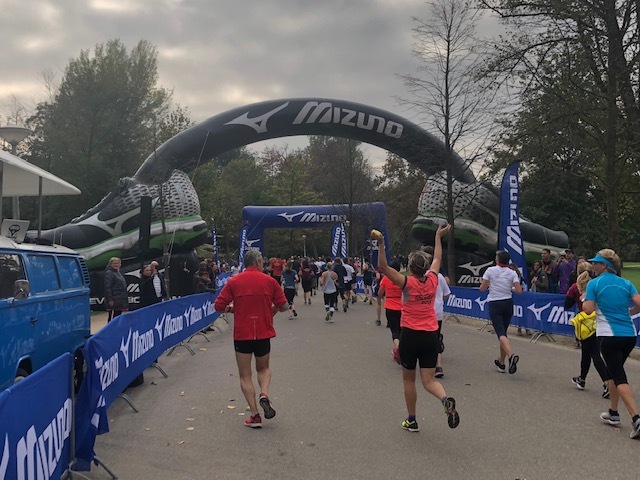 However the race started in the afternoon (1:30pm/13:30 CET) that I thought okay a good night sleep and I could tackle 21,1km (13.1 miles). So the wife and I headed to the expo that afternoon to pick up my bib. Even though the Expo was pretty small & uneventful (in terms of booths, etc), being around the buzz of people picking up numbers for the Full, Half or 8k definitely spiked my enthusiasm and desire to make it to the Start. The Full & 8k would be in the morning of the 21st (9:30 Full, 10:00 8k) so I’d have the morning to sleep in and prepare for the run in a casual/low-stress way. I got to bed early and actually got a full 10 hours of sleep! Man my body and soul needed that. The wife and I had a nice walk around the city to grab coffee and breakfast. As we walked back home, I knew I wanted to get out there and enjoy a 21,1km trip around our home city. Around 12:45, we headed over to the Start area, Luckily for us it was only 15 minutes away from our place. We almost did the very Dutch thing of biking to the race, but I thought there wouldn’t be enough bike parking… of course I was mistaken. Ha! We should’ve biked, but it was a quick Metro/walk as I said. After what felt like an hour wait in a port-o-potty line (it was about 25 min), I made my way to the start corrals. The corrals were broken up my predicted finish time (and bibs were color coded), but no one was there at the corral entrances (at least when I got there) checking bibs. So I hopped in the corral behind mine and there were a large mix of bib colors. As we made our way to the Start, the wife texted me that there were a TON of empty port-o-potties. UGH rookie mistake on my part just stopping at the first ones I saw. Haha. We slowly made our way to the Start. American music was playing on the loud speakers. The MC was sharing instructions in Dutch. Since I had no idea what they were saying, I just hung out near the 2:00 pacer. I had no time goal, but I thought at least the pacer would know what is going on… presumably! Runners seemed to be released in waves. You can see the fencing to the right in the second picture. It was the same on the left so our large group of racers were funneled into a smaller area at the Start Line, which caused some congestion. Within the first few steps, I could tell this would be a tight course from the onset. There were a lot of people around me trying to bob and weave… including the pacer. Since it was self-seeding and not much policing of the corrals, it seemed like it was kind of a free for all feeling. The pacer was diligently checking his watch and moving around the crowds to keep it consistent, which made it a little tough to follow him as he tried to find a clearer path to get into a consistent pace. Now I could tell that by the 5km mark, I was not in a positive mindset for this run, which I think partially impacted how I felt about the course. But honestly the first half of the course was REALLY BORING!! We were in the South and South-West part of the city. It was as if we could’ve been running through any suburban-type city. It felt to me like when you run through parts of a business district, where there are large buildings for places like IKEA, but no really pretty to look at. There weren’t too many spectators and I was a little disappointed. I will say I was pleasantly surprised by the number of music stops on the course!! That really helped a lot. But I knew mentally this run would be a struggle. I just wasn’t feeling it and I didn’t have the scenery I thought I would to distract me. I just kept thinking about seeing the November Project cheer station between the 10km and 11km markers. I had their energy and smiling faces in my mind pushing me forward. Since I didn’t closely look at the map so I was a little shocked when I spotted the sign for Amsterdam. Apparently we had left city limits during the first half. After taking this pic, I took a moment to stop and cheer on the other runners, which is one of my favorite things to do during a race. Let me tell you I got more stranger looks here doing that than in the States. 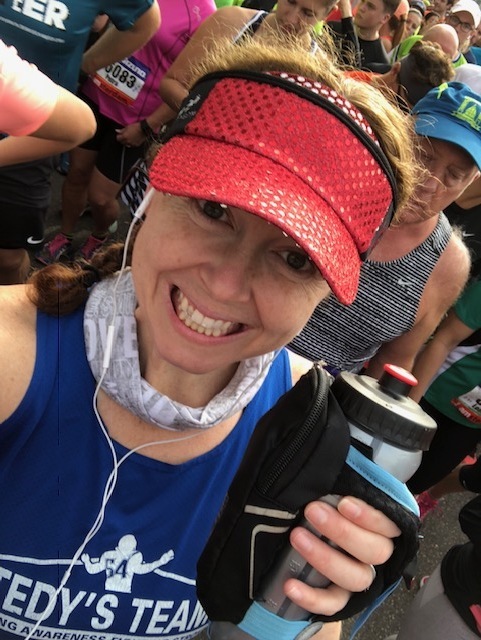 I know my methods of running most races - stopping taking pics, cheering on other runners, wearing sparkly skirts - isn’t for everyone, but it still hurts a little when I get the odd look. I think I was a little extra sensitive on this day, but I made myself push past that and be true to me! Now it was time to find those smiling NP faces… and there they were!!! They had the sweetest signs, sweatiest hugs and even a beer to share!! I needed that boost and I ran off with an extra pep in my step. They also knew the first half of the course was boring and they promised me the second half would be better! And you know what… they were right!!! 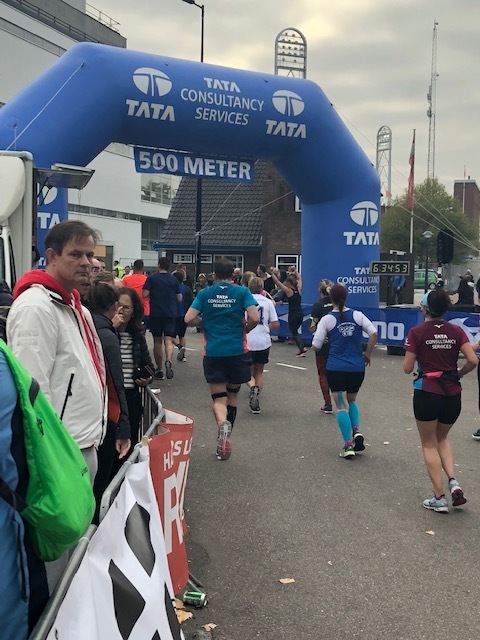 As we passed the halfway mark of our race, we started making our way back towards the Amsterdam city centre. 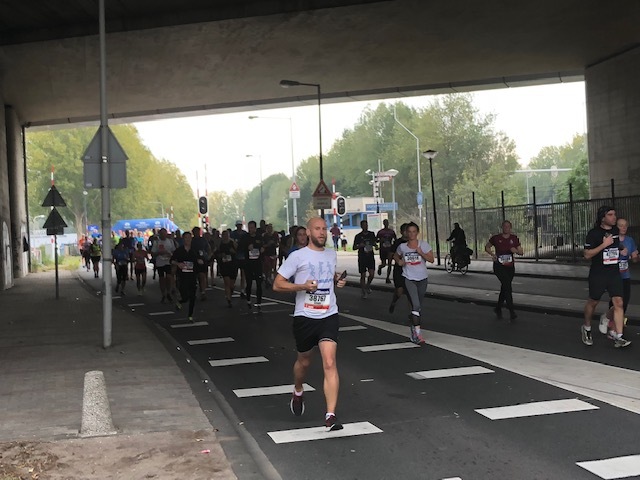 While I am bummed we run through the city centre to be near the historic buildings and the canals, it was nice to return towards the city centre which meant more spectators!! We had merged with the marathon course at 25.5km-ish mark, which was just after our 5km mark. It had been cool seeing the signs for the marathon alongside the half markers. The one downside of that were the streets were filled with the trash of 6-ish hours of runners coming through water stops. Right around this point, I really just wanted to walk off the course. I was done running. I was over the race. But I knew that wasn’t what my heart really wanted. It was all in head. As I said from the beginning I knew this would be a mental race from the onset. I told myself just to keep moving forward. And it was at that point that I knew I needed to stop, have a GU break and cheer on some more racers. That always cheers me up!! It was happening. Ha. With each step I was getting closer to the wife, who was waiting for me at the Finish, and completing half #64. Before I knew it we were near the Heineken Brewery and I was wondering if I could cut the line for a quick pint. Well the police monitoring that spot asked me to keep moving so I begrudgingly adhered to his request. As you can imagine by now I had long lost the 2:00 pacer which I was okay with. I had tried to stay with them, but the racers near him were oddly pushy and a few almost tripped me. As a result, I made the decision to slow on down just to get some open space to run. There were a lot of people in that race not looking at all around before they moved to the left or right. It was leading to quite a few “I am going to be tripped” moments. It really seemed more than usual. Not sure if it was due to where I started or if it was common for this race due to some narrow spots on the course. Thinking about all of this did help pass the time. Does anyone else do that? End up talking themselves through life questions during a race then realize 3-4km have passed? I will say that calculating kms to miles ALSO helps to pass the time during a run. :P While I am embracing the European lifestyle, I still like to figure out what mile of the race I am at. 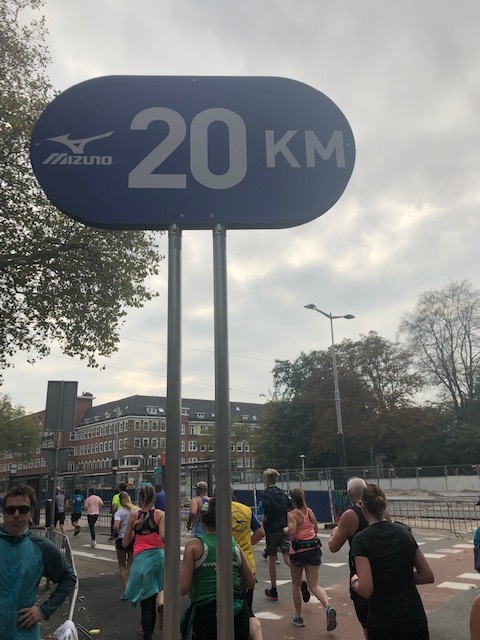 When in a tough mental spot, I will say it is infuriating to see KM signs since there are 21 of those compared to 13 mile markers during a half. While I was in the middle of that internal debate, I spotted my next character stop… and it was a 2-for!!! First up - Duracel bunny… obviously! With a little over 3km to go, we entered Vondelpark! This is the famous park in Amsterdam city centre. The place was full of spectators and other folks (minly tourists) just out enjoying the day. I’ve run through this park many a time so it was nice to be back in familiar territory. There were even more DJ spots - I think more than even the last Rock n Roll race I did. I also realized I hadn’t snapped a mid-run selfie. I mean who am I if I don’t share a mid-run selfie with all of you. I will say I am REALLY proud of how my freckles were looking this race. I will tell you not even 1km later, a lovely woman spectating the race shared a sip of her lovely Pinot Grigio with me! I think I SHOCKED her by taking her up on her offer. It gave me the kick for a little dance party with 1km to go!! Now I was ready to finish this thing. The wife had texted me that the Finish area was spectacular since you finished in the Olympic stadium from the 1928 Olympics!! In a rare moment, I opted to put my phone away so I could soak in the final 500m. Of course I could’ve taken it back out, but it was sooo cool to run into the stadium and finish running around the track! Here is the iAmsterdam sign that we passed. My Tedy’s Team mate Jackie took it prior to the race. As you can see one lone marather running along. That was the lead up to the Stadium entrance. As you entered the stadium, you were displayed on the big screen. This is how the wife spotted me! There were signs every 25m counting down to the Finish. I looked around and saw this site, it was hard not to be stunned. Just thinking about all of the people who have also run around that track. Then all of a sudden the Finish was there and it was done. I had defeated the mental demons and completed half #64! BOOM! I collected my medal and headed over to where the wife was and she snapped a couple of pics before I headed to pick up my heat sheet. Just after that I got a text from Jackie and met up with her before heading out of the Stadium to collect our water/banana/etc. After we bid farewell to Jackie, it was time to get a well-deserved beer and head home for a much-needed Epsom salt bath. Overall, the race wasn’t what I envisioned at all. I thought we would run through the city centre, along the canals, by the historic landmarks, but instead got a different view of the more outer side of the city and surrounding town. Now the positives were great volunteers, robust water stops and an amazing Finish for the race. Would I run this race again? I am not totally sure. I think if I was going for a PR (pretty flat course) or running with a friend, I would be a definite yes. 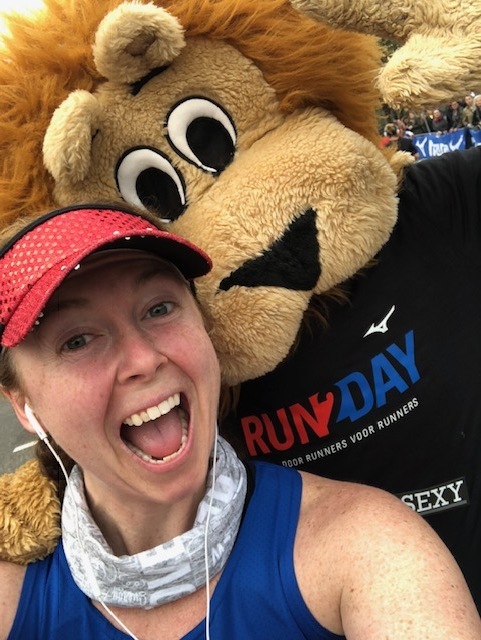 But for now, I am going to soak up running a race through another country and the pride I have in myself for digging deep and crossing another Finish Line!